Tennessee is blessed with some of the most spectacular state parks in the Eastern US, with more than 80 waterfalls and 1,100 miles of hiking trails. Many of the parks have Native American significance, including Dunbar Cave State Park. This is a cave tour with a special treat — ancient Native American sacred petroglyphs. The park holds historical, natural, archaeological, and geological features, and hosts community events in the large entrance to Dunbar Cave. 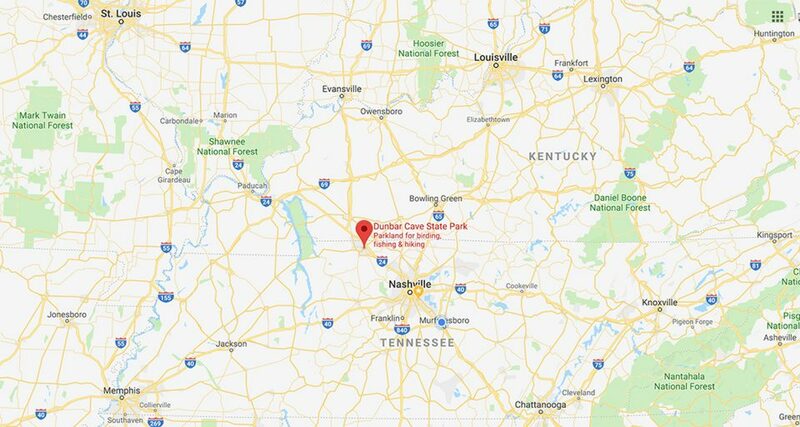 Located near Clarksville in Northwest Tennessee less than an hour from Nashville, this park is close to the Kentucky state line and is easily accessible to residents of Illinois, Missouri, Arkansas, Indiana, and Alabama. Tennessee State Parks are free for state residents and out-of-state visitors alike. However, the cave tours do have an entry fee (see details below). The Dunbar Cave site has a long history of Native American activity, stretching way back to the Paleo era (10000–8000 B.C.). It was occupied for thousands of years, with most of the artifacts found by archaeologists dating to the Archaic era (from 8000–1000 B.C.). During the Mississippian era (800–1550 A.D.), the cave was a sacred ceremonial site, and this is the period the petroglyphic cave art was created. The cave property was claimed by the Dunbar family in the 1700s, but never deeded, and was subsequently also claimed by Robert Nelson who received the deed and won a legal fight over the property. Even though the Dunbar family was removed from the property, the cave retained their name. The cave was a source of saltpeter during the Mexican-American War, and after the Civil War, a hotel was built nearby. The region became a tourist destination, and singer Roy Acuff bought the cave in 1948, using it as a music venue and adding a golf course to the property. After a few years, the hotel burned and popularity declined. The State of Tennessee purchased the cave property in the 1970s. You must bring a HANDHELD flashlight. If you do not, flashlights are available for purchase in gift shop. No lanterns, cellphones, or headlamps. The following items are not allowed on tours: backpacks, large bags, strollers, child carriers, tripods or similar items. Photography is not allowed inside the cave due to presence Native American religious symbols. The temperature inside the cave is 58ºF. You may wish to bring a light jacket during your tour. Cave walkways are relatively flat but muddy and/or slippery in places. Some stooping and climbing of steps is necessary. Because of the conditions of the cave, it is not handicap accessible and not recommended for people with mobility issues. Children under the age of 5 are not permitted in the cave. Please note the following: Arrive in plenty of time to park and check in. There is limited parking and tours begin promptly. All cave tour participants must sign a liability waiver at front desk prior to entering the cave. As a photographer, it’s a bit of a bummer that photography isn’t allowed, but I understand and appreciate the reasoning.